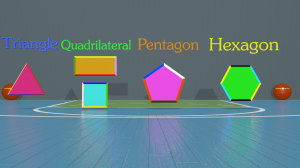 Come Learn Shapes for Second Graders and see what Angles and Sides are. Come Join Us. Learning Shapes in second grade consists of learning shapes like hexagon, pentagon, triangles, quadrilaterals, and squares. Many kids already know these shapes before second grade. The extra thing they learn is how you determine what shape it is. They learn this by finding out how many sides there are and how many angles there are. Knowing some of these basics can go a long way when geometry comes later in life. Our video is designed to help them learn how to determine sides and angles and from that know which shape you have. Please enjoy our videos. Thank you for all your support.